Bathroom remodels can either be exciting or dull, depending on the features you choose to install. At ProSource® of Columbus West, we believe that high-quality bathroom remodeling features should be available to everyone regardless of their budget, so we offer the very best products at low wholesale prices right here in our showroom. 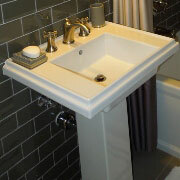 These days, bathroom sinks come in all shapes and sizes, and are always changing with the latest trends. We always stay up-to-date on new designs and provide trade pros with the best pedestal, vessel, wading pool, and standard sinks on the market today. If you think bathroom sinks evolve quickly, just imagine how recent technology has shaped the way bathroom sink faucets look and function. 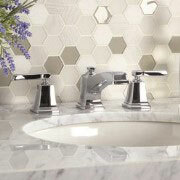 At ProSource of Columbus West, we offer a wide range of inventive faucets from trusted brands like Kohler and Design House. Picking out the right shower for your clients is one of the most important, and sometimes costly, steps in any bathroom remodel. The good news is that our showroom boasts a wide range of wholesale shower types and accessories that will fit both your client’s style and budget. If there’s one bathroom feature to splurge on, it’s the vanity. A beautiful double-sink vanity with a big mirror and plenty of cabinets and drawers has the power to tie any master bathroom together. 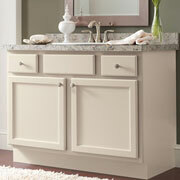 Luckily, we offer wholesale-priced vanities of all sizes and styles at our showroom. When it comes to installing a brand new bathtub in your client’s newly-remodeled bathroom, look no further than ProSource of Columbus West. 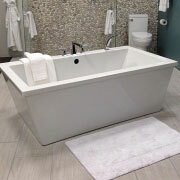 We offer a vast selection of alcove, corner, freestanding, and clawfoot bathtubs that will fit your client’s standards of luxury at a fair price. 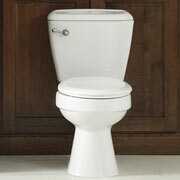 Surprisingly, there’s more to toilets than lackluster porcelain bowls and water waste. Here at ProSource of Columbus West, we offer a wide variety of low-flow, standard, and specialty toilets that your client can add to their newly-remodeled bathroom.